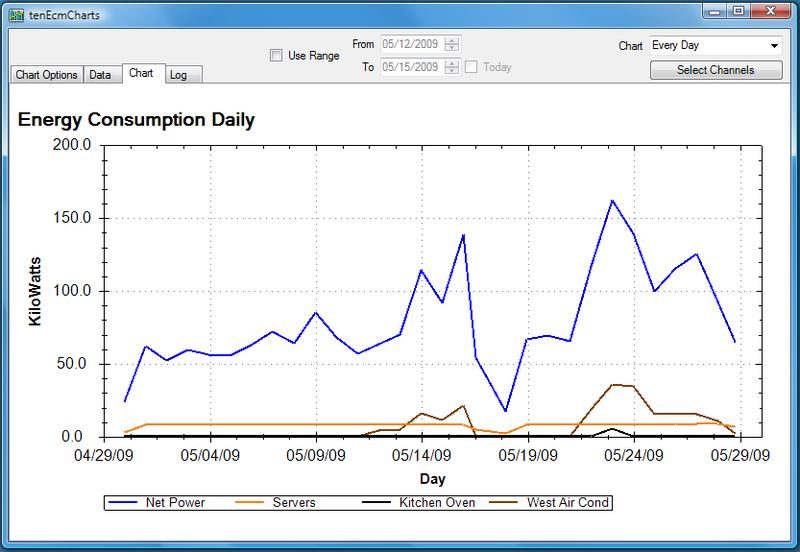 The last two charts (Monthly and Average Hour) are stacked bar charts. A typical installation will have one channel that monitors the net total power for the home, and several channels that monitor various home circuits. 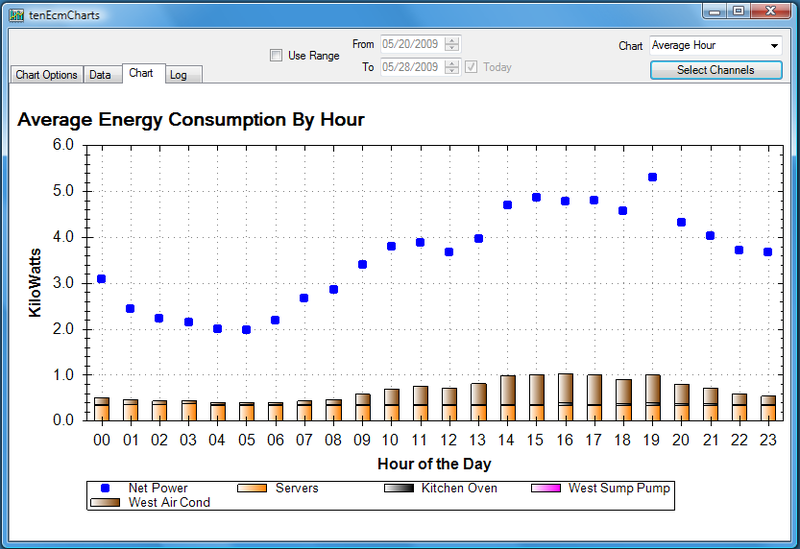 It does not make sense to stack individual circuits with total power (would be greater than total power), so these charts use a line graph to chart net total power, and multiple bar graphs to chart individual circuits. You specify which channel (Ch1, Ch2, or Ch1+Ch2) to use for net power. 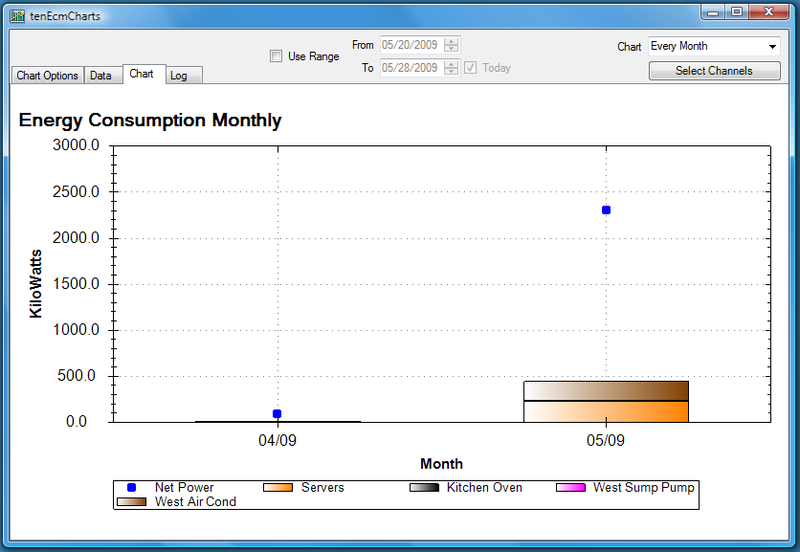 If the Net Power channel is not select to be included in the chart, then the line is not drawn. In most installations, power is always flowing from the power company to the home. A growing number of installations have the ability to generate some, if not most, of the energy used by the home. 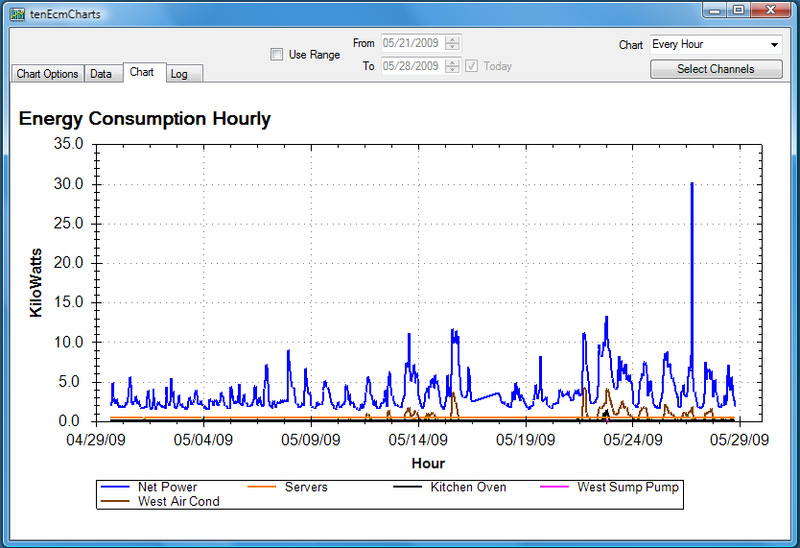 The ECM and tenEcmCharts accomodate such installations by providing a calculated channel called Net Power. This derived channel is the net energy purchased from the power company. 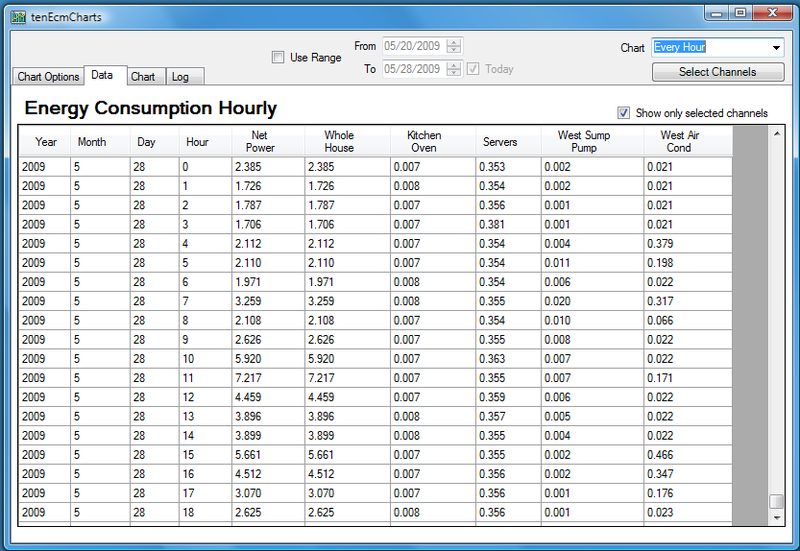 Either Ch1, Ch2, or the sum of Ch1 and Ch2 continually measure the energy flowing either FROM or TO the power company. This is always a positive number. For installations that sometimes provide energy TO the power company, the Polar counters (Ch1Polar and Ch2Polar) are integral to calculating net power consumed. 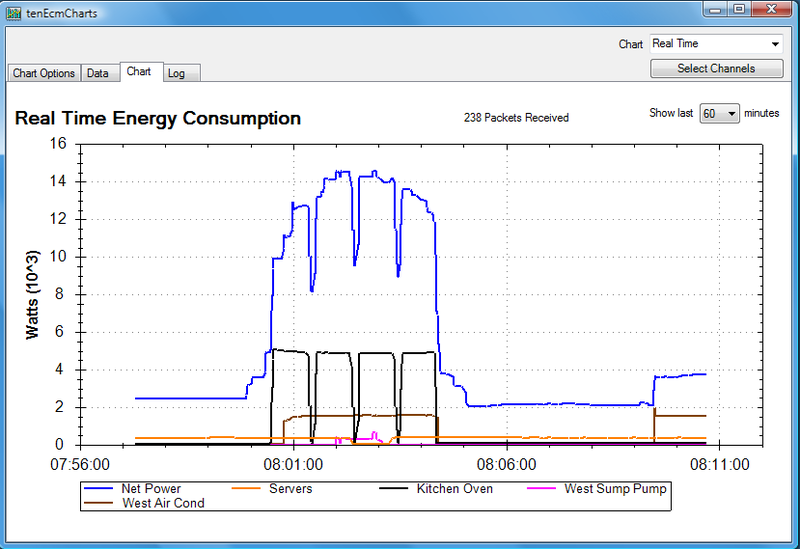 The Polar counters are also always positive (or zero) and measure only energy flowing TO the power company. In order to display historic charts, tenEcmCharts must access the database created and maintained by tenEcmDbLogger. The program will attempt to locate the database file at the default tenEcmDbLogger location. If a valid database file is not found at the specified location, a warning note will be displayed in the log and the historic charts will not be available. Use the Browse button to specify the correct location of the database file. Specify the tenEcmServer UDP Port to use to listen for broadcast packets. If you have multiple Network Interface Cards (NICs), select one to use to receive broadcast packets. You can select Any to have one selected for you. You can also specify a Receive Timeout. If the program does not receive a packet in the specified time, then it resets the network interface and reinitiates communications. Specify a number significantly larger than the expected maximum time between packets (based upon your tenEcmServer settings). Provide a descriptive name for each of the ECM-12xx channels. You select up to nine channels to display on the charts. For each dropdown list, select the channel (or None) to display. Click on the color to the right of the dropdown to select the color to use for the selected channel. All of the channels selected here will appear in the Select Channel display on the Chart panel. 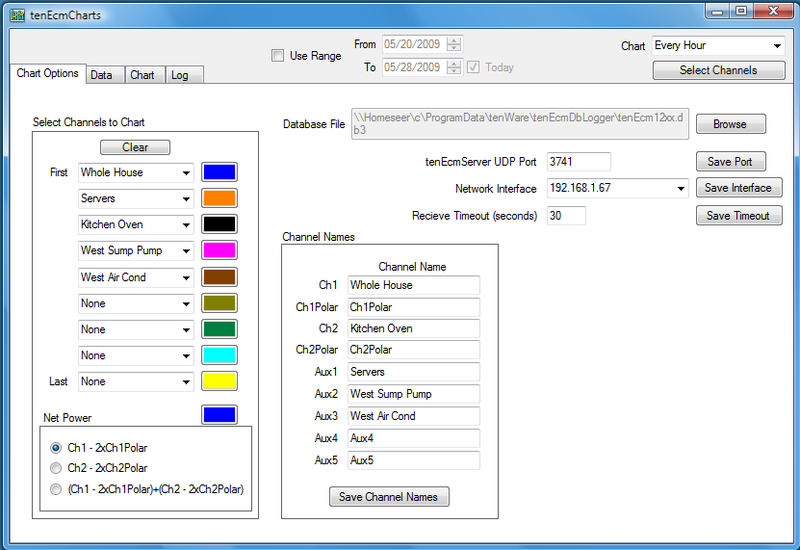 Specify which channel(s) to use for the derived Net Power channel.. This version (and all prior versions) only supports broadcasts for one ECM. The repeated error messages and dropped packet messages for the broadcast messages from tenEcmServer for ECMs other than number 01 have been eliminated. 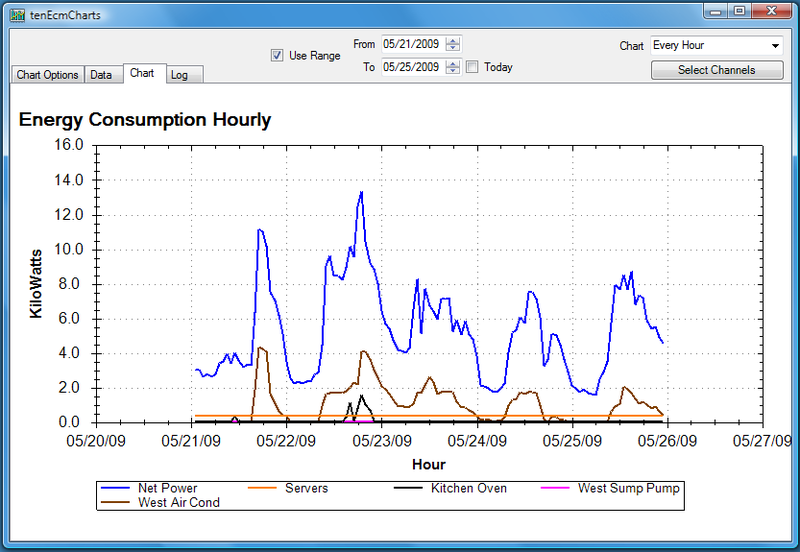 The next version of tenEcmCharts will support up to 5 ECMs. Eliminated error message in log when minimizing the chart. Broadcast packets from ECM 2 are ignored. This is to support tenEcmServer version 6.2 that now contains support for two ECMs. 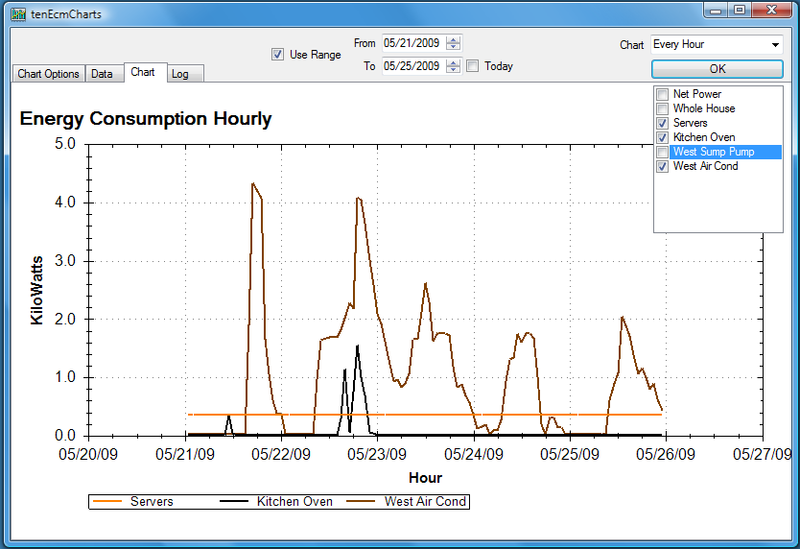 Later releases of tenEcmCharts will support two ECMs. You can now show all columns in the data grid, or only those selected to be charted. Total Power is now Net Power and is computed as, for example, Ch1 - (2 X Ch1Polar) . This calculation will yield the net power consumed from the power company, and will be negative if you are selling power back to the power company. Note: Ch1Polar and Ch2Polar must have their polarity set so that they track power only in the direction TO the power company. tenEcmServer now allows you to toggle the polarity of Ch1 and Ch2. The channels displayed on the chart can now be selected more easily from the Chart panel, without changing to the Chart Options panel. You can now specify a network interface of Any. Improved network error handling. Added option to specify UDP receive timeout. Added capability to select Network Interface to use. Computers with multiple NICs were receiving duplicate packets from tenEcmServer.